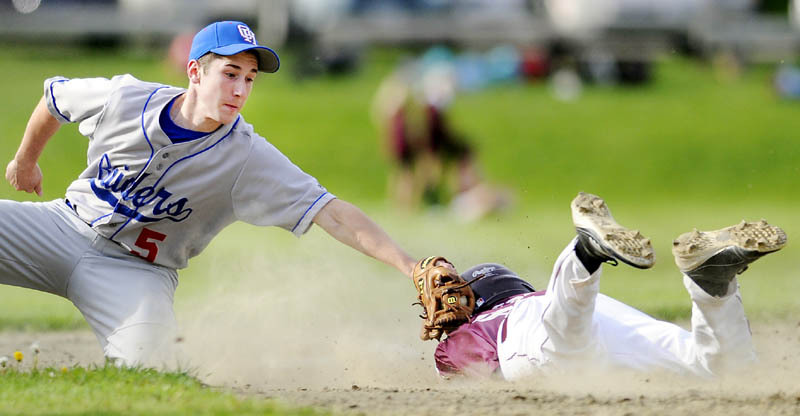 MONMOUTH -- The Oak Hill baseball team will play a waiting game for the next couple of days while the final standings in Western Maine Class B get sorted out. But the Raiders are happy to be waiting. MONMOUTH — The Oak Hill baseball team will play a waiting game for the next couple of days while the final standings in Western Maine Class B get sorted out. But the Raiders are happy to be waiting. Their fortunes Tuesday rested on the right arm of senior Ryan Riordan and he came through in a big way with a 12-strikeout performance in an 11-4 win against Monmouth. Oak Hill (8-8) is in a five-team battle for the final three spots in Western Maine Class B and will have to wait until the other teams conclude their schedules this week. Monmouth (10-5) finishes its regular season today against Telstar and is already assured of a postseason berth in Western Maine Class C.
The Mustangs have seen plenty of Riordan, who pitched for Mountain Valley Conference Lisbon the past three years before transferring to Oak Hill. After a shaky start, he retired 11 of the last 12 batters he faced. Riordan opened the season with a no-hitter against Madison, but experienced some mid-season arm soreness which shortened some of his starts. Tuesday, he threw 115 pitches and looked stronger at the end of the game than he did at the beginning. “It’s feeling a lot better now,” he said of his arm. Of Riordan’s 12 strikeouts, seven of the final strikes came on curve balls. His teammates got to Monmouth starter Nate Gagne for three runs in the second inning and four in the third. They took advantage of three Monmouth errors in those innings and got a three-run double from freshman Dalton Therrien in the third inning. The Mustangs cut the lead to 3-2 in the bottom of the second but Riordan bailed himself out of a jam when he got No. 3 hitter Billy Cummings swinging at a curve. The Raiders got a lot of production from the bottom four batters in their order who accounted for eight runs and five of their 10 hits. Freshman and No. 8 batter Jonah Martin doubled and tripled while No. 9 batter Dalton Burns scored three runs. Kyle Fletcher collected three of Monmouth’s eight hits while Devin West was the only hitter not to strike out.